LEX Scientific offers a full range of C-NRPP certified radon services to help you safeguard your buisness, institution or home against the threat of radon exposure. Our certified and experienced professionals are dedicated to reducing radon exposure and increasing public awareness of the risks of radon exposure. LEX Scientific has been active in radon measurement and mitigation since 1991. We have provided solutions to institutional, commercial and residential clients. Radon is a naturally occurring invisible, odorless radioactive gas that occurs from the breakdown of uranium found in soil and rocks. Radon gas can accumulate in enclosed spaces, such as buildings and homes, and reach unsafe levels. 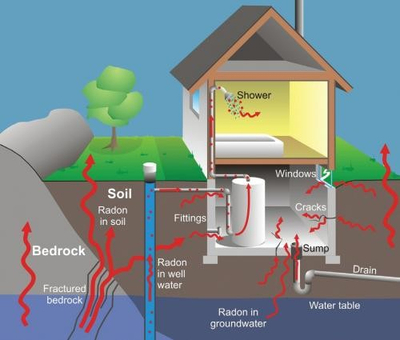 Radon gas enters from soil into buildings through cracks in foundation walls and floors, construction joints, gaps around pipes and cables, floor drains and sumps, the dirt floors of crawlspaces, and the water supply. Exposure to high amounts of radon gas increases your risk of developing lung cancer. According to the Canadian Cancer Society, radon gas is the second leading cause of lung cancer, and the first among non-smokers. 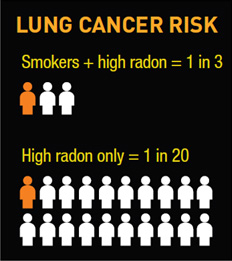 Health Canada estimates that 16% of lung cancer deaths are attributed to radon exposure. The Health Canada Guideline for radon in indoor air is 200 becquerels per cubic meter (Bq/m3). Through a cross-Canada residential radon survey, Health Canada estimates that 7% of Canadians and 8.2% of Ontarians are living in homes with radon gas levels above 200 Bq/m3. No areas of Canada are free of radon, and there is no way of knowing if a building has a high radon concentration until it is tested. If you live or work in a building with high radon gas levels, you are at a higher risk for lung cancer. If you also smoke, your risk for lung cancer is even higher. © Her Majesty the Queen in Right of Canada, as represented by the Minister of Health, 2014. All rights reserved. 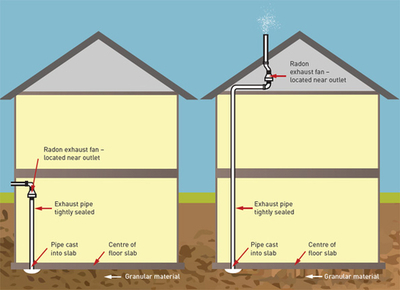 HOW CAN RADON BE REDUCED? A high radon concentration can easily be fixed with a radon mitigation system that is tailored to your specific building or home. Radon mitigation systems in homes cost as much as regular home repairs or improvements such as replacing a furnace or installing a central air conditioning unit. The Tarion new home warranty program in Ontario covers radon mitigation for a period of 7 years after construction, meaning there may be some financial coverage should radon be an issue in your home. LEX Scientific has been mitigating radon since 1991 in institutional, residential and commercial settings. LEX Scientific will do whatever it takes to reduce your radon concentration to as low as possible to ensure you are safe. But the first step, is testing your home or building using a radon gas detector.